The National Assembly speaker will hence have 2 advisers, 3 assistants and 1 referent: only 6 of the previous 22 positions will remain, according to the decision taken on June 12, 2017. There was much talk about the NA being overstaffed, with about 800 people working as experts and assistants to the speaker and members of parliament. The seismic safety system is supposed to get AMD 76,5 million less per annum. In all, 10 jobs will be cut. However, according to the Ministry of Emergency Situations, these are mostly vacant positions but not current employees. It’s also planned to optimize the agencies’ performance and carry out reforms to save more funds. In line with a decree issued by the Armenian government on June 14, 2017, out of AMD 50-million budget allocated annually to the presidential administration, AMD 178,200 will be transferred to a governmental reserve fund. The decision is conditioned by optimization process, which also implies cutting 27 jobs. In May 2017, we learned about the changes expected in the field of education. Schools with less than 300 students will be either closed or merged. In the future, the same fate will happen to the schools with less than 450 students. 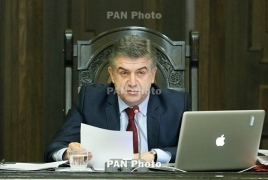 Armenia’s Minister of Education and Science Levon Mkrtchyan announced that the number of layoffs across the country will not exceed several hundred people. He said that “if the ministry fails to provide all those teachers with jobs, reimbursement will be offered.” For instance, 5 or 6 schools instead of the current 8 will stay open in the city of Vanadzor. As it was announced in May, the State Revenue Committee is expected to carry out structural reforms to include cutting 483 jobs. This could be achieved through dismissal of territorial tax offices and creation of 3 departments instead. The number of customhouses will also be reduced. The changes are meant to improve the performance of the tax authority, use resources more efficiently and reduce corruption risks. The April 2 parliamentary elections were followed by layoffs in the public administration system. The National Assembly speaker dismissed 16 assistants; 50 positions were cut by the Ministry of Emergency Situations; the presidential staff was reduced by 15. Meanwhile, the dismissed employees of the supervisory board, which could not avoid layoffs either, addressed the Helsinki Citizens' Assembly Vanadzor Office to complain about violations of the law. On April 13, 2017, the government decreed to dissolve the procurement support center, cutting 20 jobs and thus saving AMD 120 million. Besides, out of 11 offices for implementation of programs, only 5 will continue to operate. In all, it’s expected to spare more than AMD 270 million.